Crystal Cap Cleaners provides DEMONSTRATION units to customers who wish to test the technology in line. This program is designed to allow the customer a 45-day free trial of our unit with support service for a complete evaluation. Contact us now to start your 45 day free trial: info@crystalcap.com. Crystal Cap Cleaners is the preferred choice for World Wide auto manufactures when looking for the most efficient cleaning solution for robotic painting systems. 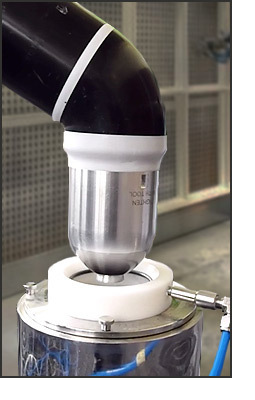 With easy installation and minimal maintenance the Crystal Cap Cleaning system uses less fluid, shortens cycle times and eliminates contamination on any robot automated paint system. Other benefits include the elimination of booth entries, reduced V.O.C.s and an increase in first run yield. The Crystal Cap Cleaner is a crucial element in a successful paint booth. Blasting the contamination from pulsing and constantly changing directions is key the success of the Crystal Cap Cleaner. An initial drying action followed by a wiping down with a second action insures a dry atomizer when using the Crystal Cap Cleaner. The compact design of the Crystal Cap Cleaner is easily mounted in the paint booth with only an air and fluid supply required.